I’ve been in Marrakech for almost two weeks now. It’s gone by really quickly, and I’m just starting to get the hang of life here. There are only two more weeks of my Unsettled experience left, and it’s been an interesting one so far. Unsettled is a kind of experience that you can’t really explain, because it’s different for everyone. It’s a coworking retreat, which means that it’s not a job. But that doesn’t mean that you need to come with a job either. And it’s certainly not a vacation where all you do is bum around and play tourist. On this particular retreat, there is a diverse group of people from all over the world – Canada, USA, Portugal, Italy, Trinidad and Tobago, Belgium, Australia, Jamaica and South Africa. No one has the same profession, and everyone’s reason for being here is different. Some live the nomad lifestyle and are using this experience to take their work on the road, because with Unsettled, your accommodation and working spaces are all taken care of for you. Some are using this month as a structured sabbatical, where they can travel and work on their own projects, knowing that they’ll have a community support them and to come home to. Some need to try something different, and some are curious about the nomad lifestyle and wish to be around people who they can learn from. We have writers who have come to be inspired, someone who works in finance but likes to travel and try new things, someone who needed a change after a heartbreak, and even a CEO who feels stuck with her work and needs a new perspective on things, among others. Prior to coming, I was curious to see how they would design an experience that suit the needs of such a diverse group of people. On our third day here, we found out. This experience is also a co-designed one. Just one of our experience ideas walls! a skill or tool we can teach? Can we organize an event/activity or lead a conversation? We also each listed the things we were looking for help with or interested in learning this month. 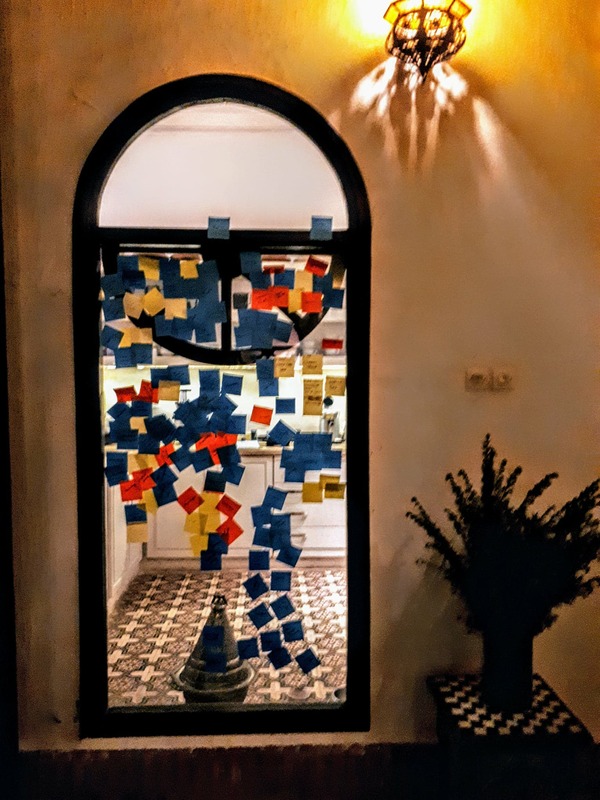 As each person spoke, we jotted down keywords on post-its – things we think we would like to learn about from that person. After everyone spoke, we broke down into groups, compared our notes, and tried to come up with realistic ways of how we can achieve what we want to learn. The amount of skills and the high number of motivation in this group is phenomenal. We put our ideas on the walls and tried to group similar ones together and tried plan out the month visually. Check out the picture – this is just one of the four idea walls! By end of the session, we had narrowed it down and turned the most common ideas into workshops, conversations, activities and adventures. Our calendar is filled with several daily activities, in addition to the Unsettled lunch and learns, trips and dinners already planned, and the ones we plan on our own. Participation (and work) is entirely optional. We have access to a phenomenal co-working space, but there are many other places to work from. 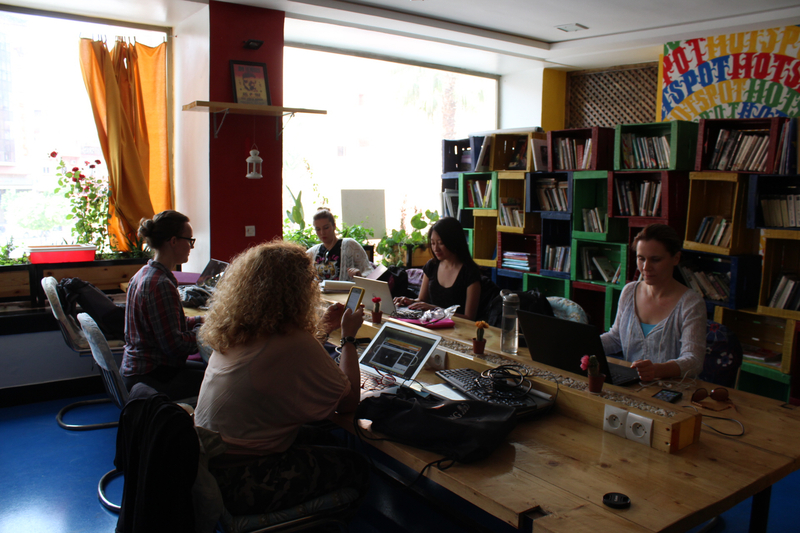 I personally have only used the co-working space twice as it’s a taxi ride or a nice long walk, but I have worked from our cozy riad lounges and rooftop cafes. So far as a community, we’ve come together to visit museums and gardens, challenged ourselves by learning acro yoga and Egyptian dancing from some Unsettlers and mapped out our lives in a goal-setting workshop. Next: We’re excited to head to the Sahara Desert this weekend for an authentic Moroccan adventure – stay tuned!